An unwavering sense of determination and positivity has enabled Ann McGowan, now 94 years old, to find strength in challenging situations throughout her life. After the untimely death of her husband when she was 49 years old, McGowan sought solace and consolation through an unexpected source: running. With talk radio playing on her pocket radio, McGowan spent hours on end running laps around her local track. “At that time, I was in a lot of stress, and I had to work and support myself. I would go up to the track and jog or walk…I never thought of being afraid. I could walk in the dark and still feel my way around,” McGowan said. Those solitary laps around the track eventually evolved into much more. “One day, I heard on the radio about Senior Games going on at Brown University for people who were 50 or older. I signed up for race walking and the 100-meter race. That’s how it all began,” McGowan said. Fast forward to present day: McGowan is one of a handful of people to compete in every single National Senior Games competition over the last 30 years. She was also one of the first to participate from her home state of Rhode Island. The National Senior Games, a biennial competition open to men and women 50 years of age and older, is comprised of 20 different sports. Over the years, McGowan has participated in many of those sports, competing in everything from the 100m, 200m and 400m races to the long jump, shot put, discus and javelin. She has even played on the national softball and basketball teams. McGowan also pushed for groundbreaking advances in the National Senior Games. “In the early Senior Games, only the men did the hammer. I went out and bought a hammer and asked to do it at the local Games so I could qualify to do it at Nationals. There was only myself and another woman who threw hammer when they offered it the first time at the San Antonio Games in 1995,” McGowan said. 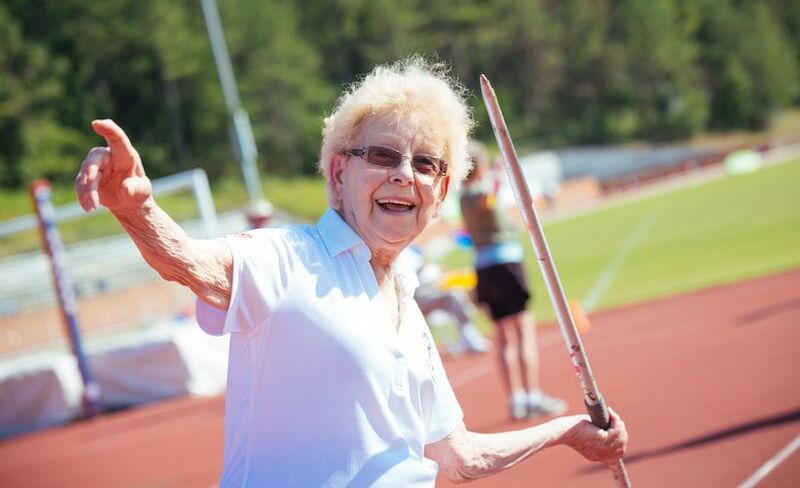 Medals and accolades galore aside, McGowan is most thankful for the friendships and memories she has made over the years as a result of her participation in the National Senior Games—one of whom, Virginia O’Connor, McGowan met at her very first Games. “There’s a group of us from New England who stayed in the same hotels, worked out transportation and went sightseeing together. Through the years, we got to be like a family. The camaraderie is wonderful. Some are retired or homebound now, but there’s about eight of us still doing local Games, and a few still go to Nationals,” McGowan said. Her key to training and staying active into her mid-90s is simple. “I pay attention to my body; my body tells me what I can do. My knees are a particular concern, but I haven’t had trouble with them yet. Every opportunity I have I get outside and walk. I do deep-breathing exercises to keep my lungs enlarged. I very seldom watch television, except when the Red Sox are on. Then I’ll stay up all hours of the night,” said McGowan, who now lives with her daughter and son-in-law, who have plenty of property on which she can practice the shot put and javelin. 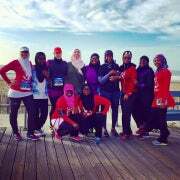 “I started out with the running, and I was quite a fast runner in my younger years. I have really enjoyed the javelin. I still practice and do javelin quite well for a person my age,” McGowan said. McGowan, who was a hairdresser, cosmetology instructor and salon owner for more than 40 years, knows a thing or two about keeping herself busy. “After I was married, I decided I should go to college. I went at night to get my GED, and then studied industrial education at Rhode Island College. I then did well in cosmetology school and became an instructor. I taught senior classes in hairdressing and became the manager of the beauty school for the owner,” said McGowan, who still cuts, tints and styles her own hair. When it comes to physical activities, McGowan chooses to lead by example. “I don’t believe in shouting to people to encourage them. You get more attention by whispering, because they want to hear so badly what you’re saying. You don’t have to preach to people to do certain things in life,” McGowan said. Her theory worked. After watching their grandmother earn hundreds of medals over the years, McGowan’s three granddaughters were inspired to follow in her footsteps. Two were track stars at their high school and one went on to complete McGowan’s ultimate dream: the Boston Marathon. “I was talking to Grandma, and I asked about an athletic accomplishment she wished she could have achieved. 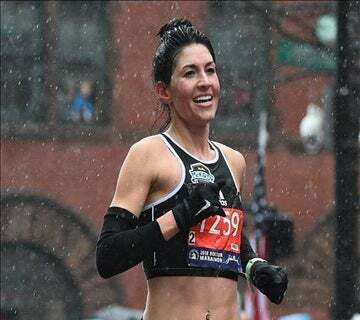 Once I knew, I put the Boston Marathon as a personal goal of mine,” said McGowan’s granddaughter, Liz Vinci, who ran the Boston Marathon in 2016 and 2017. “She gave me training tips, and I brought her the medal.” Vinci ran for the Next Step Fund in Cambridge, Mass., which supports free educational programming for youth with rare genetic diseases and chronic illnesses, such as cancer. The charity has a special significance to the family, since McGowan is a breast cancer survivor. All three of McGowan’s granddaughters are runners, and they affectionally claim, “This is all Grandma’s fault!” With them as a prime example of her influence, McGowan hopes to continue to inspire others through her collection of medals. “Eventually, when I make time, I will donate them to certain schools, sports and organizations to motivate children and younger people,” McGowan said. What began as a method of coping with a challenging life event evolved into a lifetime of physical feats and cherished friendships—and through it all, McGowan continues to inspire others with her determination and resilience.